Happy to share that this is my 100th release since starting my releases with the Karma Deck in 2015. So this has a special price which is all of 100 cents. And comes with my heartfelt thanks and deep gratitude. 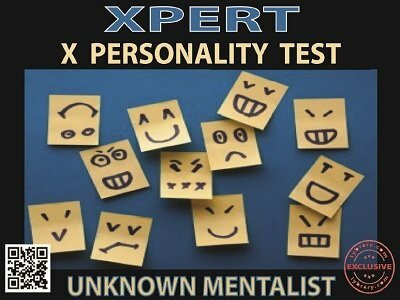 XPERT , which is short for X Personality Test, is a self working and fun personality test which can be performed with a lot of flexibility and yet delivers solid impact. It is engaging for the participant and easy for the performer to do. Just a few business cards and a one time preparation is all you need. The participant is given a few double blank business cards which have different personality traits written on both the sides of all the cards. The participant first mixes them and then creates an apparently random sequence of cards. The stack of cards she finally ends up with will have 2 random personality traits showing on the top and bottom, of course. The participant will be surprised to note that both these traits are part of her personality. All this while, the performer is looking away or in another room or can even be blindfolded. But now he can divine both these personality traits exactly. The routine can be ended by giving a personality reading, which is optional. The routine has totally 5 phases and the performer can use as many or as few phases as he wants depending on time and situation factors. There are no sleights, no stooges and no preshow. It is totally hands off. There is next to nothing to reset and can be instantly repeated with a different outcome. No math, no peeks, no gimmicks. The cards are fully examinable before, during and after the routine. In fact the performer never touches the cards after handing them over to the participant. This is a fun routine and you will enjoy performing it. 1st edition 2018, 19 pages. This is another GREAT effect by the UNKNOWN MENTALIST. I see myself doing this (When I get the time to simply write words on the business cards) AND PRACTICE IT. The impact of this effect far exceeds the method used. And for ONE DOLLAR it is a worthwhile investment whether you use it or not. Well done UNKNOWN MENTALIST! I definitely recommend this.